Woodbine Cottage was the subject of an extensive renovation programme that was completed in March 2006. The accommodation is spacious for its eight guests and has the benefit of on-site parking for one vehicle. As Woodbine Cottage is situated within the historic walled town centre, during the months of July and August visitors can experience the pedestrian scheme within Tenby, Pembrokeshire which converts the walled town to a café culture, vehicle free zone in order that the restaurants, coffee shops, public houses and gift shops can be enjoyed safely at a leisurely pace. Woodbine Cottage benefits from two reception rooms with feature fireplaces, a dining room, kitchen and wet room. The kitchen is equipped with all up to date appliances. There are also a laundry room and bedroom downstairs. Upstairs there are three further bedrooms, two with king sized beds and a family bathroom with a roll top bath and Mira shower. Outside is a secluded courtyard area with seating for eight. Access in July and August: During the months of July and August, dates to be confirmed each year, Tenby operates a car-free zone within the town walls between 11am and 5pm. During this time access is restricted as the streets are utilised by restaurants and bars to create a cafe style atmosphere in the town. A car pass is necessary to be able to drive in and out of Tenby during this restricted period. It is important that you do not lose this pass as it is specific for the property and will need to be given to the next occupants at Woodbine Cottage so that they can enter and leave Tenby. Your co-operation with this is much appreciated. Practical Matters: Please do not wear stiletto heels as these damage the wooden floors. Please dispose of all rubbish (location of disposal sites in help file in the property) before you leave and do not leave it outside where the seagulls can destroy the bin bags and spread the rubbish in the street. Please do not sit on the sofas in wet swim wear. Please try and rinse off all sand before entering the property. There is an outside tap with hose at the front of the property. We have dispensed with the kettle Weber barbecue as this was unused, but we would be grateful if you do decide to barbecue that you use a disposable one and please do not place it on the glass table outside. Pets: We welcome pets throughout the year, but ideally only between the months of October and April because access to the beaches with animals outside of these months is restricted. Please contact us to discuss further as we have pets ourselves. Pets are not allowed upstairs nor on the furniture downstairs and must not be left alone in the property. Bath towels provided from January 2015. Please note that beach towels are not provided. Gas hob with 5 rings. Sufficient dishes and utensils for all 8 guests with ample spares. Tenby and Trefloyne courses are nearby. A lovely home from home in a great location in the centre of Tenby. We enjoyed a very relaxing stay here with our pets and would definitely book again. 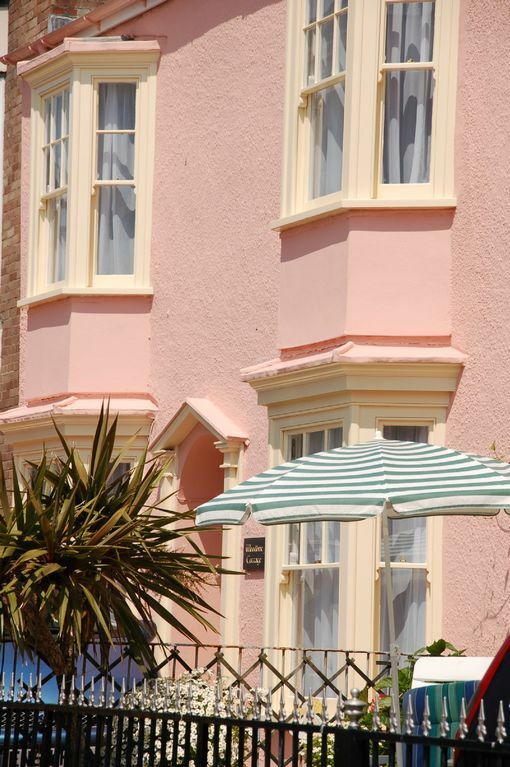 Lovely cottage in the perfect location for everything Tenby has to offer. Beaches, shops, restaurants and pubs within easy walking distance. Two large double bedrooms ideal for 2 couples and two small single rooms. One of the small bedrooms does have two single beds but this makes it too cramped for adults but would be fine for children. Fantastic power shower. Only complaint would be that the pressure for the cold water tap in the bathroom wasn’t very good. If you’re looking for a cottage in Tenby then I would recommend this one. Very enjoyable stay right in the heart of Tenby with parking. Within easy walking distance of all the local amenities. A nice and very well presented property which I would highly recommend. Woodbine Cottage is very conveniently situated, being close to the town centre with all the shops, pubs and restaurants as well as the glorious beaches which Tenby offers. The house has two very large and comfortable double bedrooms, as well as a smaller upstairs bedroom with single beds. It also has a further single bedroom downstairs. The upstairs bedroom is large and well equipped and there is a further shower room downstairs. The kitchen is very well equipped with everything you need. The two living rooms are large and well equipped. The whole house has character and for the week we were there, with eight adults, a six year old and a baby, along with two dogs is proved to be a great choice. The best recommendation is that we would book it again without any hestitation. Great cottage and brilliantly appointed. We stayed as a group of 8 with 2 dogs in July 2016. The cottage is amazingly appointed, literally a stones throw from South Beach and a two minute walk from the centre of Tenby. The cottage provides everything you could need. The two sitting rooms mean there is plenty of room for all and the large dining table (and outside table) meant we could all sit down together at each meal. Really enjoyed out stay and already planning to return. Only criticism we had was that for 6 adults the sleeping arrangements are tight. The ground floor room has a single bed with a trundle bed to create sleeping for 2 people. When this bed is pulled out there is literally no room for anything else. A better solution might be to put 2 smaller single beds in here like they have on the first floor. Thank you for your welcome review of Woodbine. We have thought long and hard about how best to arrange the sleeping arrangements in the 4th bedroom that takes the number of guests to the maximum of 8. We have found over the years that keeping that room with a single (trundle) bed is the best option as often the [elderly] guest who stays there appreciates the extra room given that the downstairs wet room is close by and suits them if they have a mobility problem. However, we will continue to monitor use of this room and respond to our guests requests as best as possible. Thank you once again for your constructive comments, much appreciated. We look forward to having you stay again in the future. Woodbine Cottage is within the town walls of Tenby in the picturesque county of Pembrokeshire that is host to a wide variety of attractions to suit all tastes. The property offers a very convenient base to explore both Tenby and Pembrokeshire. Woodbine Cottage is situated 50yards from The Paragon and South Beach. Pembrokeshire is renowned for its Celtic history, picturesque scenery, beaches and many and varied activities as well as for its arts and shops. Beaches include Tenby South, Tenby North, Saundersfoot, Broad Haven, Manorbier, Coppet Hall, Amroth, Newgale, Barafundle, Broad Haven South, West Angle Bay, West Dale, Priory beach at Caldey, Waterwynch, Monkstone, Sandy Haven. Oakwood theme park, Heatherton Park, Folly Farm are all close. Shopping in Narberth is not to be missed. Numerous cliff top walks are near. Many outdoor leisure activities are within close proximity: coasteering, windsurfing, canoeing, sailing, fishing, golf, horse-riding, quad biking and cycling.